Me and D: Guest Post: Holy Pump Supplies! Today's post come from my friend Caroline! She and I have a lot in common (i.e. we are HUGE nerds). 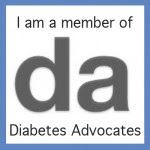 Caroline blogs over at ACT1 Diabetes and you can follow her on Twitter. So Jess is doing vacation Bible school this week. Isn't that darling? I grew up as an involved Presbyterian, but somehow I never participated in VBS. Diabetes did give me the runaround in my high school youth group, though...Every summer, my youth group FISH (Fellowship in Senior High) went on a retreat to Assateague, MD. It was a time to camp on the beach and sing, swim, pray, play, and talk about God and life. In my senior year, I was among a small group of people going down early to help set up the camp. I was more excited than anyone in their right mind should be about hammering stakes. I was also a total procrastinator* and had an unfortunate history of leaving important things like deodorant behind. So I stayed up all night packing. “Don't forget your pump supplies,” my mom kept harping to me before she went to sleep. I, in turn, kept rolling my eyes at her and telling her I would be (sigh) fiiiiiiiiiine. Except I sat by the front door at 3 AM, waiting for the enormous yellow Penske truck to come chugging down my quiet street. And once I hopped in and the truck started chugging towards church, I realized I had left my meter on the kitchen table. So the big yellow moving truck went back to my house, waking up our neighbors all over as I dashed in to retrieve my meter. Not a crisis, right? Just a little embarrassing. Until we got to Maryland, unpacked the truck, and set up the tents. I started pawing through my bag for a change of clothes, only to see.....I had forgotten my pump supplies. You can bet that anything out of my mouth with “God” or “holy” at that moment was definitely NOT a prayer. I went outside and paced on the sand, considering my options. There was no way I could last a week with the one cartridge and infusion set I had in my backpack as backup. But this would mean 'fessing up to my parents that, despite their constant reminders, I had still forgotten my diabetes gear. The horror! Finally, I decided to wait until that evening, then pulled out my brick of a cell phone and called my mother. Looking back, I bet it was immediately more see-through than Swiss cheese and Anthony Weiner's excuses about his junk. “Well....sure, sweetie,” my mom said, playing along. At least until I specified that she should really overnight everything....I mean, you never know what could happen! When I came back, tan and happy, she gave me a serious Mom Glare. Whoops. Maybe I need to put all this churchiness to good use and pray really hard that I have everything with me? *note: in addition to still forgetting things....I am still a huge procrastinator. Fortunately, I usually remember deodorant now. Thanks Caroline! Who hasn't forgotten D supplies, right? Oh, the things we put our parents through.